The standard range of STM grinding and selection mills are suitable for plants producing large quantities on an industrial scale, where operational and performance parameters are generally measured in terms of reliability over time and relation of energy used to granulation quality and productivity. However, there are certain market sectors where the interest is focused more on the quality of the end product, as well as small enterprises which are synthesizing new compounds, investigating new applications or preparing patent applications, and here the quantities required are limited to a few kilogrammes, or even a few grammes. 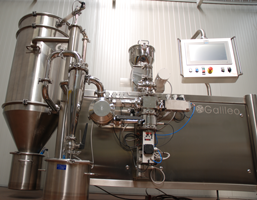 The Galileo line is the ideal solution for research and development, for producers using expensive ingredients in cosmetics, pharmaceutics, plastics, ceramics, specialized chemical products and other new materials, and where processing happens in small batches. 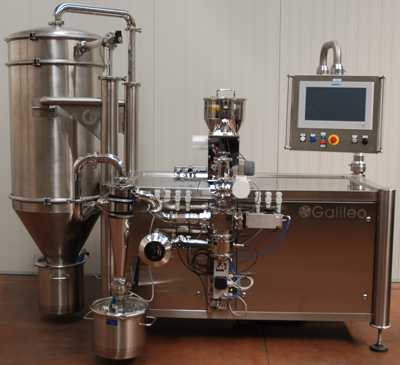 Galileo is a multi-function laboratory system which is highly innovative in technological terms. The operating principles of the Galileo counter-top machines are exactly the same as those of the industrial versions of the same machines. This means that a client who trials micronization on a reduced scale has the guarantee of being able to transfer the laboratory process to an industrial-scale machine, thanks to an accurate and meticulous up-scaling of productive capacity. Ease of use: the client is guided to introduce the required analytic objective and desired granulation, while the machine's electro-mechanical parameters are regulated automatically. Ease of maintenance: interface with the control panel guides the tasks, methods and timing of maintenance. Ease of cleaning: every component of the machine is designed to be easy to clean, with polished internal surfaces and no rough or inaccessible areas. 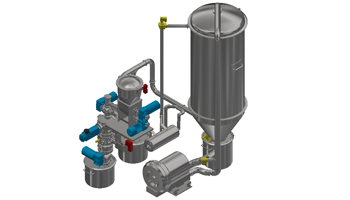 Flexibility; ideal for initial phases of development of single components or compounds in powdered form. The equipment consists of a workbench with interchangeable grinding and selection tools, a single unit with three different machines, for R&D departments producing up to 10 kg/h, or minimum batches of 0.5 cubic decimetres of material. 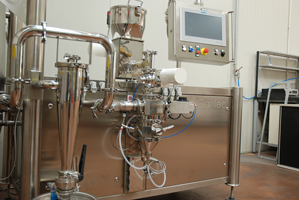 The system comprises a series of 3 individual machines which are specially designed for small batches; the tools and electronic equipment used are of the highest standard of design and the technology is cutting-edge. The mechanical processes are integrated with a series of electronic devices which monitor the transformation of the material, analyse the parameters of the process and collect and analyse physical, chemical and mechanical data detected by the instruments during the grinding operation. 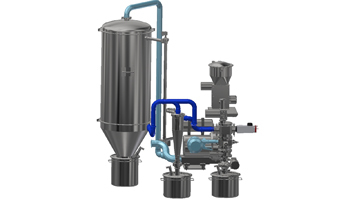 CL - pulverization cyclone with granulation classifier. The product is fed into the grinding chamber, where the grinding disc impacts the particles against the armor of coating mill. 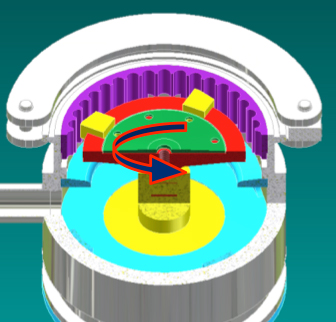 To have a greater effect, the material is subjected to collision, friction and shear, in the space between the grinding bodies and the coating, in addition to generating trajectories that intersect and terminate on the armor optimizing the kinetic energy and the efficiency of grinding for self-impact of the material. 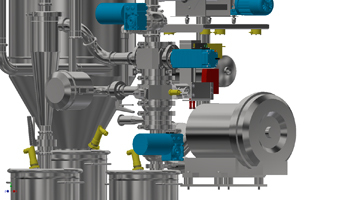 The milled product is conveyed towards the classifier with variable rotation, which makes a selection of fineness produced in relation to the specific weight of the particles. The material whose fineness has not yet reached the required values is cyclically reported in the impact chamber for further milling. The grinding is realized striking the material with concentric jets of air / nitrogen at high pressure. In this way it is exploited the internal friction of the product, the particles rubbing and impacting against each other producing the pulverized material. The separator integrated with variable rotation is used for the preselection of the material at the entrance and for the automatic recycling of the product until obtaining the desired particle size. 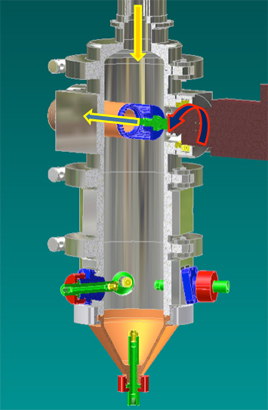 The dynamic separator is composed of a chamber in which a rotor high-speed and variable rotation, allows to fluidize the product eliminating particles which do not fall within the specific request. 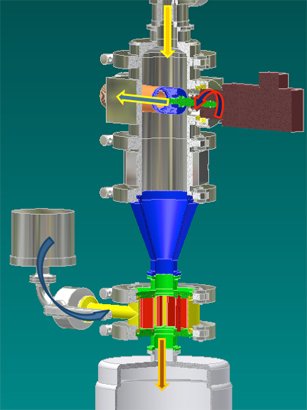 The dosage material is conveyed to the rotor through a dedicated, concentric grid. 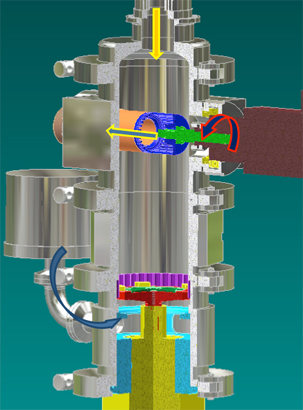 The combined action and contrasting air and the centrifugal force from the rotor, according to air flows and pressure losses controlled, allows the extraction of materials having size and / or different specific weight, this adjustment is scaleable in order to obtain the required result. The initial characteristics of the product are unaffected, but there is with precision and repeatability, a division between the coarse particulate and the finest one.